Single neurons in the brain are surprisingly good at distinguishing different sequences of incoming information, according to new research by UCL neuroscientists. The study, published today in Science and carried out by researchers based at the Wolfson Institute for Biomedical Research at UCL, shows that single neurons, and indeed even single dendrites, the tiny receiving elements of neurons, can very effectively distinguish between different temporal sequences of incoming information. This challenges the widely held view that this kind of processing in the brain requires large numbers of neurons working together, as well as demonstrating how the basic components of the brain are exceptionally powerful computing devices in their own right. First author Tiago Branco said: "In everyday life, we constantly need to use information about sequences of events in order to understand the world around us. For example, language, a collection of different sequences of similar letters or sounds assembled into sentences, is only given meaning by the order in which these sounds or letters are assembled. "The brain is remarkably good at processing sequences of information from the outside world. For example, modern computers will still struggle to decode a rapidly spoken sequence of words that a 5 year-old child will have no trouble understanding. How the brain does so well at distinguishing one sequence of events from another is not well understood but, until now, the general belief has been that this job is done by large numbers of neurons working in concert with each other." Using a mouse model, the researchers studied neurons in areas of the brain which are responsible for processing sensory input from the eyes and the face. 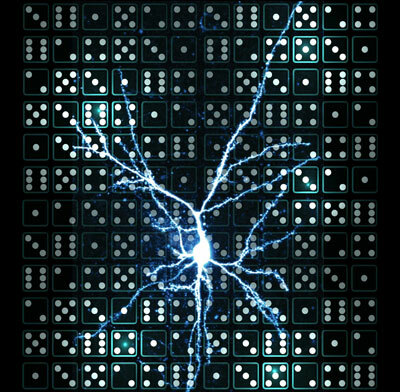 To probe how these neurons respond to variation in the order of a number of inputs, they used a laser to activate inputs on the dendrites in precisely defined patterns and recorded the resulting electrical responses of the neurons. Surprisingly, they found that each sequence produced a different response, even when it was delivered to a single dendrite. Furthermore, using theoretical modelling, they were able to show that the likelihood that two sequences can be distinguished from each other is remarkably high. Senior author Professor Michael Hausser commented: "This research indicates that single neurons are reliable decoders of temporal sequences of inputs, and that they can play a significant role in sorting and interpreting the enormous barrage of inputs received by the brain. "This new property of neurons and dendrites adds an important new element to the "toolkit" for computation in the brain. This feature is likely to be widespread across many brain areas and indeed many different animal species, including humans." Funding for this study was provided by the Gatsby Charitable Foundation and the Wellcome Trust. UCL Neuroscience brings together all UCL neuroscientists to unravel the mysteries of the nervous system. They work across seven major themes to make fundamental discoveries about brain function and behaviour, to teach and train the next generation of scientists and clinicians, and to transform our ability to diagnose and treat neurological and psychiatric disease.